See our Specialized M16 Gallery for other stunning Eagle Nebula images. Eerie, dramatic new pictures from NASA's Hubble Space Telescope show newborn stars emerging from "eggs" -- not the barnyard variety -- but rather dense, compact pockets of interstellar gas called evaporating gaseous globules (EGGs). Hubble found the "EGGs," appropriately enough, in the Eagle nebula, a nearby star-forming region 7,000 light- years away in the constellation Serpens. 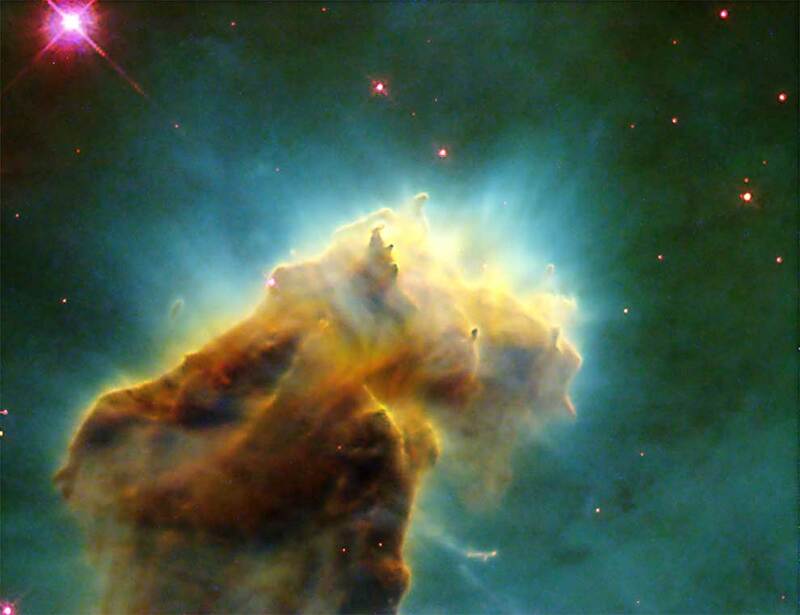 Striking pictures taken by Hubble's Wide Field and Planetary Camera 2 (WFPC2) resolve the EGGs at the tip of finger-like features protruding from monstrous columns of cold gas and dust in the Eagle nebula (also called M16 -- 16th object in the Messier catalog). The columns -- dubbed "elephant trunks" -- protrude from the wall of a vast cloud of molecular hydrogen, like stalagmites rising above the floor of a cavern. Inside the gaseous towers, which are light-years long, the interstellar gas is dense enough to collapse under its own weight, forming young stars that continue to grow as they accumulate more and more mass from their surroundings.